Well, after a month or so of operation with the SB-200, my first “oops” happened. I went to turn on the amplifier and I thought I had everything correct and when I went to TX I heard a loud “Pop” sound. Quickly shut off the amp and disconnected the power. Opened the case to find that one of the resistors and the parasitic suppressors popped. I knew something was going to happen because the resistors were turning black. Since I had to fix the suppressors, I figured this was the time to do some other “Modifications” to the amp. 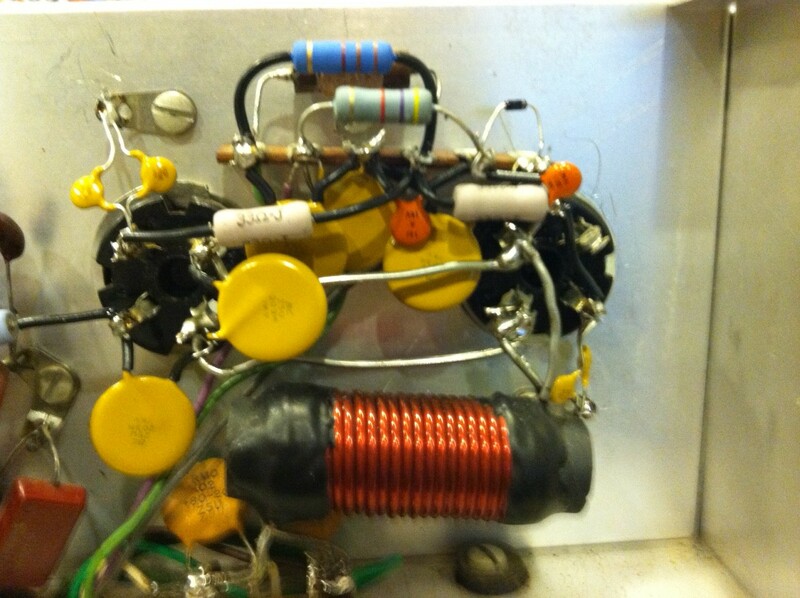 When I first rebuilt the amp, I ordered all the parts to do almost all the mods that you see on KL7FM’s SB-200 Page. I figured since it’s opened up, this would be the time to do SOME of those mods listed on his site. Are these mods needed?.. Nope! If they were then I would assume that they would have been incorporated a long time ago. I just figured if it makes it run a fraction of a percent better, why not invest the extra couple of dollars. In this photo I replaced the two 33ohm carbon resistors that I had with some higher wattage metal oxide resistors. 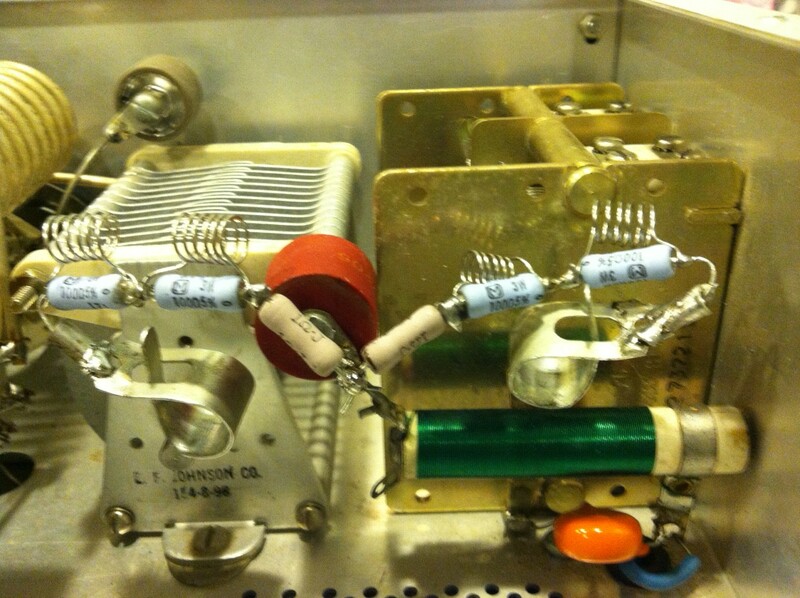 I then replaced the 3300Ohm resistor with a high wattage metal oxide type as well. I also replaced the 2 200pF caps with 4 470pf 1kV. I guess by replacing the caps, there will be decrease the grid-to-ground reactance for better improvement on the lower bands. 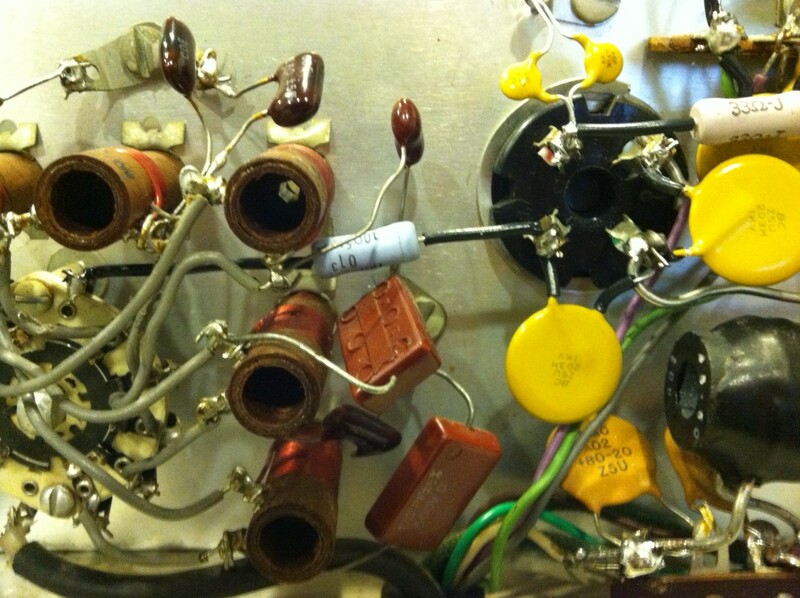 In this photo I replaced the nylon protected wire for the input to the cathode and replaced it with a 10Ohm 3W resistor. I guess this will help dampen the VHF oscillations as well as help by prevent over driving the amplifier. After hooking everything up, The amp turned on and sprung back to life. After messing around with it for a couple house, I haven’t really notice really any improvements. doesn’t mean nothing is happening which is WAY better than having it break on me. So it was a success. When the time comes to install the new fan, I am also going to do more modifications that were on that website that have to do with protecting the power supply and the meter. I might even go as far as replacing the meter light with an LED that turns Red when I’m TX. I also might change the “REL Power Sense” POT with a Switched POT so I can put the AMP in standby mode. Hopefully after this, I will never have to go in that amp ever again!